This morning we had to wake up early for JJ’s appointment with his oncologist. I was so afraid of oversleeping that I didn’t really sleep much at all. JJ didn’t sleep much either. EJ slept well, but he didn’t sleep much the night before so we were all three quite tired. In the first stages of JJ’s cancer battle, each appointment with a doctor gave us the worst possible news, the worst fears come true. At first we told ourselves that the lump was “probably nothing, but we should get it checked out,” When it turned out to be a mass, we said, “Well, it’s probably not cancerous.” When it turned out to be cancerous, we thought his first surgery would take care of it, and then we found out the cancer had spread and he needed Chemo. Maybe that’s why every appointment with the oncologist has a tiny bit of anxiety mixed in. Although we always have strong hope that we will get a good report, we know that sometimes the news can be bad. We’ve talked to people who have had their cancer return and many young men have died of testicular cancer. I wonder if we will ever get past the slight dread of doctor appointments? Thankfully, the oncologist gave us a very good report. JJ’s CT scan was clear and his cancer markers were zero. Everything is very good. Whew. We felt a surge of relief. The next oncologist appointment will be in three months. As we drove away from the Cancer Center, I told JJ that he is no longer a young man with cancer. Instead, he is a SURVIVOR. Yay! In honor of a brave young man who has fought a cancer…. Scented with Vanilla Bean Noel. 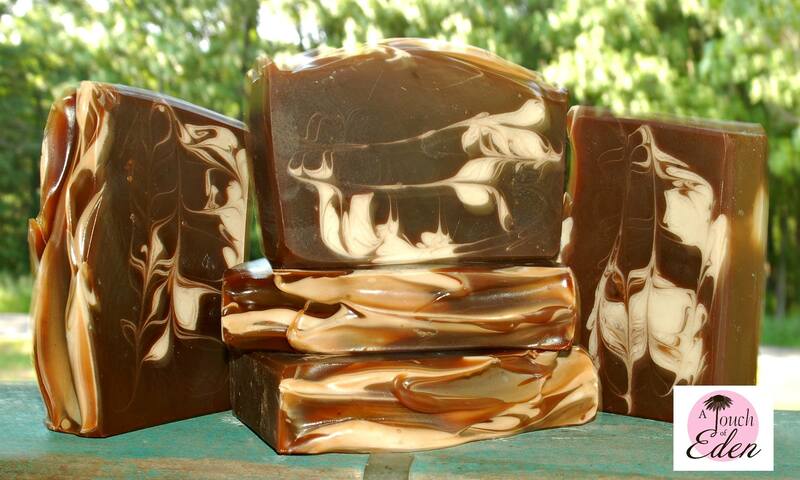 Remember me telling you that my friends makes and sells beautiful soaps through her website called “A Touch of Eden”? A few months ago, she said that she has several friends who have had various types of cancer and she wanted to honor their battles by making a unique soap for each of them and naming it in their honor. She sends each of them one of the bars of soap as a gift. Well, I bought all the 13 remaining soaps she had made in honor of JJ. All of them. After we left the meeting with the oncologist, we turned down the hallway where the Chemo rooms are so we could give each of the oncologist staff who had so lovingly cared for our son a gift of his special soap. I had also made a card of thanks for them with the story of the soap my friend had made to honor her friends who had battled cancer. Of course, we also verbally told them the story behind the soap as we handed them out. They all were touched by the gift. Aside from the soaps for the oncology staff, we had four others that we could give away. I am sending those to friends who gave us loving comfort while we were fighting JJ’s cancer. If I could have, I would have sent this unique soap to many, many people because there were so many who gave us love and support during this difficult time. However, we could not send soap to everyone who was special to us, so we had to choose only four. Because the Post Office supervisor had declared that the perfect-sized boxes were unsellable, I sent the soaps yesterday in the almost-perfect-sized boxes. So not only is there a story behind the soap, there is also a story behind the boxes. Everything is a story. When we got home from our trip the Cancer Center, JJ went immediately upstairs to sleep. I lay on the couch to nap but I couldn’t sleep so I went outside to see if I could get the lawn mower started. It’s always possible that it could have fixed itself, you know. But no such luck. S0 I came inside and asked EJ if he could fix the mower. We can’t let the grass get too long because, besides the fact that I love a neatly mown lawn, if the grass gets more than six inches tall, the Village will charge us a fee. I thought the problem would be easily fixable, but it turned out not to be. EJ worked on it for about an hour, trying this and that to fix it, and he could get it started but he couldn’t keep it running. He said it’s not my fault that the mower isn’t working, but I have such a difficult working relationship with mowers that I believe they all hate me. In addition to the lawn mower, this morning I couldn’t get my computer to run. Like the mower, it would turn on for a few seconds and then shut itself off. I suspect the machines are beginning to stage an uprising like in science fiction movies. On the way home this morning, we all said that we should have taken my laptop to the repair shop, which is very near the Cancer Center. We had all briefly thought it this morning before we left home, but none of us had actually acted upon our thoughts. So probably on Monday EJ and I will take it to the shop, and hopefully it will be something minor instead of major. Meanwhile, I am using EJ’s computer when he is at work. I am grateful for his generosity, but I miss my computer. Thank you for this blessed report I’m so happy for JJ and for you both. This is the best news I had in days…..And what a lovely gesture to give the people who cared for you in the Cancer Centre a bar of that special soap wíth the story that is so special. And I loved the small video of the sparrow since I heard you both TALK again……..If your computer is back we have to meet by Skype and talk together that would be great. I slept a little bit better the treatment of the physical therapist ( and this time it was a colleague of my own therapist a young women but she was really good) did made it in the hours of the night less painful on the spot on my back so I could sleep more. Hopefully we are getting somewhere in this….